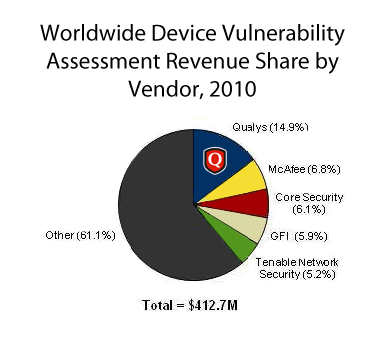 Qualys today announced that IDC ranked the company number one for Worldwide Device Vulnerability Assessment Revenue Share for 2010 by Vendor for the third consecutive year with 14.9 percent growth. This growth, documented in the IDC Worldwide Security and Vulnerability Management 2011-2015 Forecast and 2010 Vendor Shares, is contributed to accelerated adoption of Qualys&apos; cloud-based security and compliance solutions by global enterprises. To date Qualys has gained the following adoption to its cloud-based services within global indices including 50 percent of the Forbes Global 100, 48 percent of the Fortune 100, 60 percent of Dow Jones 30, 41 percent of NASDAQ 100, 43 percent of DAX 30, 58 percent of CAC 40, 41 percent of FTSE 100 and 17 percent of Nikkei 225. "Qualys continues to grow its market share with comprehensive vulnerability management services that help organizations proactively scan critical assets and take the action needed to reduce risk," said Charles Kolodgy, research vice president for security products at IDC. "Qualys has also effectively used its cloud-based delivery model to offer low cost, comprehensive services that are easily integrated with partner solutions so organizations can quickly respond to rapidly evolving threats. IDC predicts Worldwide Vulnerability Assessment Market revenues will grow by 9.7 percent from 2010 to 2015, with a projected value in 2015 of $1.2B. "Given the importance of risk management, government regulations, and exposure through vulnerabilities, the security and vulnerability management market is full of opportunity," said Kolodgy in the report. View the full announcement. To read an excerpt from the report, visit www.qualys.com/docs/idc_VM_forecast2012.pdf.